I was born on September 3, 1932. My parents were Olive Tanner and Winfred Kimber. I am one of the fortunate people that grew up in Grouse Creek. The experiences and people there influenced me much. I have always been grateful that I was raised in such a peaceful, happy, atmosphere surrounded by people who knew me only too well and loved and accepted me still. I felt so secure. What a great opportunity to be able to grow up among most of your close and not so close relatives and to know them all well. I lived in the same house all my life until I left home to go to high school and college. This was where my mother and father taught me to work and to play in just the right proportions. Amanda Tanner, my mother’s mother had the home built around 1916 so that she could move over from Etna with my mother and be closer to church and ward activities. My mother and father moved into it while my grandmother was still alive to help take care of her. She lived in the front rooms and mom and dad and Delma and Dorothy, my sisters, in the back four rooms. I never knew Amanda as she died before I was born. I did know my grandmother, Josie Kimber. I loved to visit her because she was always so jolly and happy. I was sad when she moved away to Brigham in the 1940’s. My mother and father were extremely hard workers. I think they both enjoyed working and making something nicer than it was before. My dad would help my mother on washdays. They would get up about 4:00 a.m. and begin so that he could help mom scrub the sheets on the washboard and help her wring them out before he went to work. When we got the wringer washer it was a great time saver. Mom would help dad with his work also. I can remember her making out his time slips for him every month when he worked as a county road grader. She would also write his letters as he dictated. One year she painted several white signs with black letters indicating where all the little towns around the county were. While he was away on road trips she was the homemaker, gardener, cook, and cow milker. I never did learn to milk the cow. We called the cow Old Heifer (how original) and were so very sad the day she went down the road with a herd of beef cattle on their way to Lucin to be shipped out and she stopped and looked up the lane and bellowed for her home. We were losing part of our family and the memory remains poignant to this day. We usually had a garden, which I was required to weed. Other work was mowing the lawn with a hand mower. Other jobs, as a small child, besides helping with housework, was to kill flies for a penny a fly and kill mice for a nickel a mouse. I also fed pigs daily, carrying the slop up to the corral and hoisting it over the pigpen fence. Slop was a good word for it because much ended up on my socks. By the pigpen was the chicken coop. I always gathered eggs and fed the chickens but don’t remember getting paid for it. On Saturdays we had to go through the entire house and sweep, dust, pick up, etc. We would divide up the work by drawing jobs on slips of paper. If our work wasn’t done by the light of the day then we finished it by the light of night thanks to the coal oil lamp. But finish it we did! However, sometimes, to break the monotony, my mother would stop in the middle of the work and we would have a game of hide and seek in the house. She knew how to keep us happy. Wash days were hard because all clothes were hung on the line and in the winter the line was in the house, stretched from corner to corner in both the kitchen and living room. To help them dry faster, we would sometime put them over the wood-burning stove in the living room. I can remember standing there holding on to them and watching the steam rise as they dried. One day I forgot to stand there and a brand new pair of pajamas was ruined because big burn streaks were across them. The sad thing was my mother had just finished making them for me. This was their first washing. I can imagine how bad that made her feel. Growing up was a lark. My playmates were Richard, Thurman, and Marvin Kimber who lived just across the lane and Gordon and Billy Tanner who lived up the lane and Irvin Kimber who lived two doors away. We mostly played tree tag, hide and seek, kick the can, run my sheepie run, or cowboys and cook. (With me as the cook.) Noreen Kimber lived three doors from me and we played house. Her playhouse was in their outdoor cellar on the property south of them. My playhouse was on the front porch behind a wall of vines. We would visit each other with our “babies.” and eat our water and bread or whatever else we could scrounge up for our play meal. Sometimes even the boys would come and visit us in our houses. They weren’t as comfortable there as they were on their stick horses. Later I had a playhouse in what we now call the granary. I loved that place. I would spend a lot of time up there with my cat. We always had a cat. 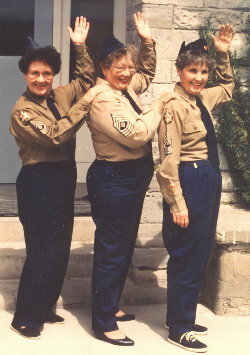 One of them, “Tootsie” was with us until I was twelve. She had kittens twice a year and it was my mother’s job to get rid of the kittens but we usually got to play with them for awhile before she did. Up through our teen years we were still playing the fun physical outdoor games, but also started just walking around trying to find something to put some excitement in our lives. We would build bon fires and cook potatoes. In those days there was no tin foil. We just threw them in, pulled them out all charred and black, rip that part off, put a little salt on them and eat. They were so good! . One time we walked across the field in front of my house and went over the first low ridge of hills. We each chose a personal tree and set it on fire. We had huge fires with lots of smoke but no one ever came to see what we were doing. We were lucky a range fire was not started. We would also go on long hikes, the favorite place being the rock quarry. (Which wasn’t long at all) When nothing else was going on we would try to push someone’s car away from where it was parked or sneak around at night peeking in windows. We would also crawl along on hands and knees through sagebrush and dirt to spy on a couple that would be parked in a car. It was all done in good fun. Never did we expect to see anything we shouldn’t. It was just a matter of trying not to be heard and seen and giggling all the while. Grouse Creek always had dances. There were dances for people moving away, for soldiers going off to war. dances for the holidays, such as Fourth of July, deer season, Thanksgiving, and Christmas. They also had a Sophomore Swing every year for those graduating from the tenth grade and moving on to the big city. It was the dances that gave me my most pleasure. I began dancing as a tiny child. We sometimes had our own children dances with the same wonderful orchestra playing for us as they did the big folks. The orchestra consisted of Raida, Ivan, Grant, and Lyman Kimber and Archie Toyn. We also were welcome to dance with the grown ups too. So we would hook on to each other and follow them around the floor. Delma and I used to come home from the dances and mimic the steps we had seen others do so many times. We’d say, “Now let’s do George and Mandy or Ross and Grace or Val and Hat.” I have always loved dancing and am glad it was so much a part of my life. It was such fun! I admire the adults in our lives who worked so hard to make our lives rich and interesting. Ball games were arranged between the small towns and many times a summer, we would go to Yost, Park Valley, Almo, Malta, and Elba to play ball. There was a boy’s team and a girl’s team. Eula Kimber would play with us. She was a very good pitcher and she taught me to pitch. Competition was not what it is today. We liked to win but if we didn’t that was okay too. One time at Almo at a boy’s game the ball was hit in left field, but there was no left fielder. In a minute or two Dale Warburton came wandering out of the outhouse that was in that vicinity. No big deal! We all had a good laugh and the other team got a run. We became good friends with many of the kids we played against and after the games we would be invited to their homes to clean up if there was a dance afterward. They would sometimes feed us too. My parents usually went to the games and dances but when they didn’t we would all pile in someone’s car and go. In my case, I usually got a ride with Dwight and Carol Warburton. In the winter we would go down around Park Valley to get to a dance in Naf and then back the same way. We would get home about two or three in the morning. At this time it was dirt road all the way except for the little stretch between the Park Valley turn off and the Naf turnoff. Over the mountain was sometimes muddy and rocky. I’m sure the cars in those days took a good beating. A boy I dated from Elba, Lynn Pettingill, told me he lost fourteen tires in his sojourn back and forth over the mountain. Sometimes we would arrive at dances covered with dust in our hair and clothes but we didn’t let that stop us from having the best time of our lives. Involvement was so much more important than appearance. I don’t think we were ever spoiled or too picky about how we went or who with. The important thing was to get there and have fun! Even in my day a lot of the transportation was by wagon or sleigh or generally walking. My parents never got in the car and dropped me off somewhere to visit. If I wanted to go there I walked. The same with my friends, if we wanted to sleep over outside, we carried our blanket or quilt and pillow with us as we walked. Kids I run around with besides those mentioned, were Jean Paskett, Carol Warburton, Norma Tanner, Colleen Roberts, and Joan Kimber. 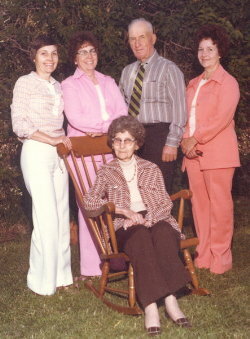 Donna Kimber, Marilyn Warburton, Faye Wakefield, and Darlene and Ada Frost. The last five moved away and it was always so sad to see our friends leave, because there were just not that many kids. As I moved into the teen years I used to tag along with Delma and her friends, Lela Kimber, Eva Tanner, and Audrey Tanner when they would let me. Because we were few in number, age span made little difference. Any one interested was included, no matter the age. There were no cliques or discrimination. It was heaven! My parents, of course, were the greatest influence. They both loved Grouse Creek but my mother thought the desert was not pretty at all. I grew up thinking it was nothing to brag about to “outsiders” but now I think the desert is beautiful. Dad thought Grouse Creek was the prettiest place on earth, especially up Pine Creek. Their interest and involvement in the community made me have a deep sense of security and love for it. My aunts and uncles were in most cases my second parents. The people all watched out for each other and helped to “straighten out” anyone they saw not doing as they should. To me that is a plus and I draw strength from the things I was taught there and from the example of people that surrounded me. I wish that every child could have the wonderful childhood and teenage years that I had. 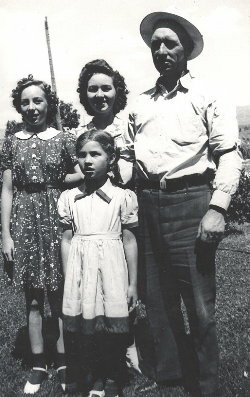 My parents love for their parents and ancestors had a great influence on my desire to do genealogy and family history. I left home the fall of my junior year to attend Box Elder High. This was a ritual with all students in Grouse Creek. Most went to Brigham to live with relatives but a few went to Tremonton or Ogden. I went with my cousin and friend Colleen Roberts to Brigham. We stayed with a Mrs. Romer and her sister in law. When she got married after three months we moved in with Edgar Richardson and his wife. We left there after three months and went to live with our Aunt and Uncle Ralph and Chloe Tanner on 332 North Main. Ralph was working in Grouse Creek at the time so was only home on occasional weekends. Deloy, her son, was my age so that poor woman suffered through three teenagers for the rest of that year and the next. She was a good cook and I gained weight, in spite of the fact that we walked probably a mile or more to high school each day. Stopping at a small diner and having a shake very often on the way home probably contributed to my weight gain. I liked high school but it took some adjusting. I loved having the different teachers and seeing so many kids and the different subjects I could take. The kids were friendly but I was chagrined at the cliques that existed. I didn’t want to belong to any of them and tried to be friendly with all. There was a great deal of people going steady and I thought to myself, “What a waste, so many opportunities missed to have fun and dance with other people. My favorite teacher at Box Elder was Elmer Jeppsen, an English teacher. He had a dry sense of humor but made us work very hard. Every week we had to memorize so many vocabulary words. He would call us one by one to his desk to tell him the spelling, definition, part of speech, and a sentence. He would look solemnly over his glasses at me. I was intimidated but I think I learned a lot. When he died several years later I understand they had to hold his funeral in the Brigham tabernacle because of his many admirers that wanted to attend. Many of my weekends were spent catching a ride to Grouse Creek so I could see my folks and not miss out on any of the hometown activities. Sometimes Colleen and I would catch the bus to Strevell and someone would meet us, usually my folks, and take us to a game or dance. After a dance at Naf they would take us to the bus stop again and we would catch the bus back to Brigham. I don’t remember how we got from the bus stop to Chloes but probably we had the bus driver drop us off because she lived on Main Street. After high school I went home to live during the summer. The last summer home I decided to go to Weber College. My folks were supportive but it was not their idea. I think Jean Paskett and Carol Warburton had decided to go and that may have given me the idea. I was only going to go for one quarter to see how I liked it. It didn’t take but that one quarter to find out that I loved it. Kids were there from Brigham and the Ogden kids were so friendly. I lived with my sister Dorothy, her husband Al. They had three or four children at the time. We lived on Pierce Ave. and I usually got to school by Al dropping me off as he went to work. I’m sure he made lots of trips that were not necessary except for my welfare. They were both so good to me. Weber at that time only had a student body of one or two thousand. There may have been not even that many. I majored in Secretarial Science and loved my teachers. Mr. Christensen taught most of those classes and he was such a good teacher. Another class I loved was Shakespeare taught by Mr. Monson. I learned from that class to appreciate and love literature and from then until now have taken many classes in literature and reading. In the summers between school years I worked in Ogden. One summer at General Mills for Lloyd Hadley and Dave Richards. They were both very nice to me. My job was to transcribe their dictation from a Dictaphone, write letters and log sales and acquisitions. I also worked for the USDA at the Ogden Stockyards in the Meat Inspection program and caught the bus to work. When the buses went on strike, I walked. It was quite a distance as it was over the viaduct in West Ogden. Frequently Al would come by and give me a ride. I lived on upper Twenty Fifth Street with Velma Duke in an upstairs bedroom in the stately home of Minnie Barton. She was an aristocratic lady who was good to us and let us use her kitchen. My second year at Weber I lived at Bertha Eccles Hall which is now an Art Center. I roomed with Verla Bond from Coalville, Velma Duke from Honeyville, Shirley Jones and two other girls, whose names I don’t remember. We had fun in that dormitory doing the things that college girls did in those days. We studied late at night and often under the wire just before a test. We talked until wee hours of the morning and watched boys just like they watched us. We prepared our own meals in the downstairs and ate in the luxurious dining room. My meals were pretty good but we didn’t prepare together so I did my own cooking and it wasn’t always the healthiest. I again gained weight, partly because of my food preparation and again because of my love for ice cream shakes from the campus bookstore. Those were too great years and because of friends I made there I decided to go with them to Brigham Young University. The summer prior to moving down six of us lived in an apartment on Ogden Ave. An elderly alcoholic man and his wife lived in the other side of this small house and we shared the bathroom. We didn’t even have a bedroom but only a pull down bed and a couch in our tiny living room. The apartment was $60.00 and we each paid $10.00. We managed in those small quarters because some of us were working swing at Hill Air Force Base and because some of us would go somewhere else for the weekend, but there was always someone asleep or someone eating in our tiny kitchen. I can’t say it was a pleasant summer but looking back on it now it provides us with our greatest laughs. With the money we saved with our cheap rent I bought several pairs of shoes to go with me to college. I worked at Hill Air Force Base that summer for a Leo Lohrman in the Vehicle Maintenance Dept. He was the boss that no one would ever wish for. He demanded that we were busy but there was nothing to do. Ann Taylor from Garland and I used to paint our fingernails, write letters or whatever while he was out of the office and save the work so we could be busy when he was there. He was a cleanliness fanatic too and we used to clean the phones etc. with alcohol. I don’t think that is a bad idea now but then I thought it was a little much. It was here that I became disgusted and disillusioned with the government and the money wasted. I saw first hand many wages being paid for very little work. I know that is not true with every government office but my experience here and other state government offices I worked for part time, taught me that there are a lot of free loaders at the tax payers expense. I was asked to stay overtime one night. Leo and I just sat around and drank pop. My overtime wages would not be anything to shout about but his would be highly excessive. While at Weber I met my future husband Val. Ted Morris came to me one day and said someone with the initials Val wanted to meet me. I saw him only once on campus because he had been going to the Y. He and Ted picked Velma Payne and me up from a swimming class one night and we spent the night laughing. That was the beginning of many laughs with this very funny man. 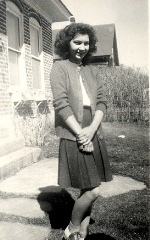 I only dated him about four or five times before he left for his mission in December of 1952. He was at the Y and I was at Weber and then I was at the Y and he was home in Ogden. No promises or commitments were made but I was pretty sure he was for me. Brigham Young University was every bit as much fun as Weber had been, but now it was a student body of 8,000 but still small enough to feel like you knew who most were. I learned to begin loving college for the sake of learning and not just for the fun I was having. I majored in Elementary Education and spent a lot of time on the old lower campus where those classes were taught. We went to assemblies in the George Albert Smith Field House, before the Marriott Center was there and attended church in the Joseph Smith Building which is no longer there. There was a campus branch and everyone met together. We lived just down the stairs and a half block west from the J.S. Building. Six of us girls were in a home owned by Brigham Young University. We had no rules like the dorms and we had a great time. I had several different roommates over the two years there and most of them were from Ogden. 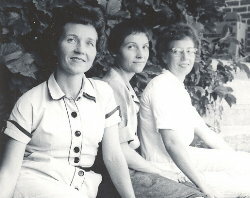 We took turns cooking the meals for each other and caught rides sometimes to Ogden where I would stay with Dorothy or Delma. I made a lot of friends there from all over the United States and had fantastic teachers. I am so glad that I was able to go there and owe much to my friends for the influence they had on me to attend. The second and my senior year at Brigham Young University I lived in the same house with some of the same girls and some different ones. I counted at one time that I had a total of about 29 roommates while going to school and working before my marriage. After graduation some of us moved to Salt Lake. We lived on Beverly Street in a basement apartment of Mrs. Porter for one summer and then moved to the Trenton apartments on First South and Fifth East. I worked at the Lewis Grocery Store during this first summer and began my teaching career at Garfield Elementary in the fall. Garfield was in a nice little middle class neighborhood in Salt Lake and the children were wonderful. I taught second grade. Val and I were married in June 1956, one a half years after he returned from his mission. I was still teaching at Garfield. When the principal found I was expecting a baby in May he made me quit as was the rule back then. Neither the students nor I were happy. There was no maternity leave—no leave period. Val was working at Western Airline (now Delta) and going full time to school at the University of Utah. When the airlines went on strike he had to seek other employment because there was no money so we could wait out the strike. He took a job as a teller at Zion’s Bank. That began his career as a banker. Val and I lived in Salt Lake in three different apartments in Salt Lake. The first was on Yale Avenue in the basement of the home of Dr. Charles and Katherine Rich. Both Clark and Bruce were born while we lived there. We moved to West Capitol Blvd for a larger apartment but only stayed a year because we could not afford the rent. The third apartment was on Fourth North behind the capital in the basement of Aileen Ashton’s home. By the time we left we had four children crammed into two bedrooms. 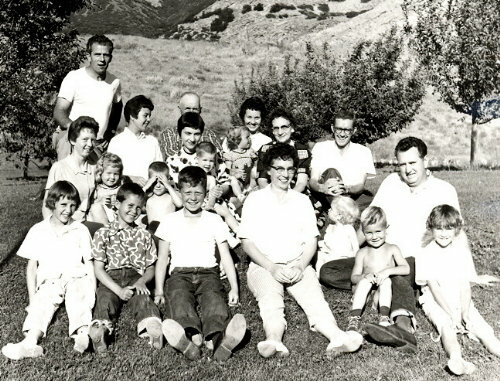 We moved into a new home in Bountiful at 623 East 250 North October 1964. I still reside at this home. My career as a full time mother began when my first baby, Val Clark, was born May 1957. Bruce Kimber was born a year later. Todd Neil and Ann Elizabeth were born in 1962 and 1963 while we were in the apartment behind the capital. Three more children were born after we moved to Bountiful. Martha Jane in 1967, who lived only six days and died with spinabifida, Emily Brooke in 1969 and John Kimber in 1971. Our children were spaced in sets of two at three different intervals so each time my youngest of the set would begin school I would substitute teach at elementary schools two or three times a week. This worked out well because I could leave and come home with the children. After a while I decided elementary subbing was too hard and began substituting at Viewmont High. That was a fun experience. I substituted during Ann’s high school days at Viewmont and got to know a lot of the kids her age. Because of boundary changes Todd was going to Bountiful High while Ann was going to Viewmont. After twelve years at Zion’s Bank, Val moved to Walker (now Wells Fargo ) and then to Commercial (now Key Bank). It was during his tenure as Vice President at Commercial that he became ill with Alzheimer Disease and retired with medical leave in December 1984. This was a traumatic time for him and for our family. I went back to teaching in the fall of 1985 because I thought that if I waited I would be too old to get a job later on. Thankfully, I had kept my teaching certificate current by attending classes throughout the years and I was assigned to teach at East Layton Elementary. 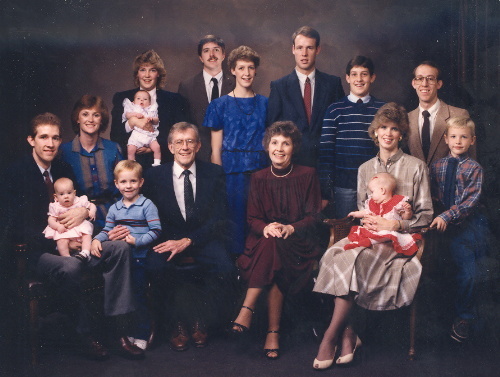 I took care of Val, with the help of my children and taught school until he passed away in December of 1988. That was extremely stressful because of the pressures at home and at school. It was also a very sad time for our family. When Val got sick it was worse than death because he was the leader, the anchor and stabilizer and could no longer exercise his influence. He had a pleasant countenance and manner and had always smoothed out any rough spots in our family or at his work. He had been bishop of the Bountiful Sixteenth Ward and I think the people genuinely loved him. He loved the youth and they loved him. He totally spoiled me with his good humor and considerations for my welfare. My impressions on those first few dates had proven correct. After his death I continued teaching fifth grade and retired in June of 2000. During those years many changes took place. We were a traditional school and then went to an extended day program and from there into a year round school. Each change brought the usual frustrations for parents and teachers. People would choose sides both in the community and the faculty. It was difficult during those years but I loved to teach the children and learned to love the teachers I worked with. I became particularly close to the fifth grade teachers with which I taught the last few years. In spite of the many frustrations, it was a rewarding occupation. My children were all married in the temple. They are all active in the Church of Jesus Christ of Latter Day Saints, which makes me happy and grateful. They have been good to me. They are raising good families and live very busy productive lives. My life has been full. I love to do many things but I am not a master at anything. One of the things I like to do is collect history about Grouse Creek. Some day I hope to write a book. I have worked in the church since my marriage and was fortunate to serve a proselytizing mission in Sydney, Australia 2001. I have loved sports, both participating and as a spectator and have friends that I meet with regularly. I enjoy cultural events and being with my family. I have traveled to Japan, Morocco, Kenya, Greece,Turkey, Israel, Egypt, Amsterdam, Jordan, Spain, Granada, Italy, Austria, England, Switzerland, and Australia as well as several of the states. One of my better trips was with my children in 2000.We attended the Passion Play at Oberamergau, Germany. I like to travel but I am just as happy working in my yard and home and enjoying the wonderful things Salt Lake City and Utah has to offer. In 1981 my mother died and my father died in 1990. In 1999 we finally divided up his property in Grouse Creek and now I have a small stake in my old hometown. I spend some time in a cabin on the Lizzie Kimber place and in my folk’s home with my sister Dorothy Covieo and with Delma and Verl Smith in the Carl Peterson cabin. I love the Church of Jesus Christ of Latter Day Saints. I love the truths it teaches. I love life. It has been wonderful to me.